English edition of Philips 836893 DSY with different cover artwork. 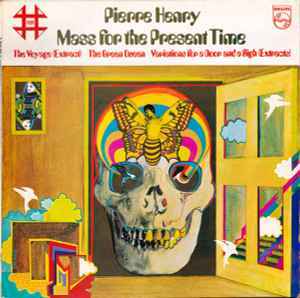 This record brings together a series of works Pierre Henry composed especially for French dancer / choreographer Maurice Béjart. Tracks A1 to A5 were composed for the piece 'Messe pour le temps present' in 1965. Track A6 was composed for 'Le Voyage' in 1962. Tracks B1 to B6 were composed for the piece 'La Reine Verte' in 1963. Tracks B6 and B7 were composed for the piece 'Variations pour une porte et un soupir' in 1965. Catalogue number 4FE.8004 is only on the record labels.